See Removing the Battery on page 52. 2. See Removing the Middle Cover on page 56. 3. See Removing the Keyboard on page 63. 4. See Removing the RTC Battery on page 63. 5. See Removing the MimiPCI Card Plate on page 63. 6. See Removing the Thermal Module on page 64. 7. Lift up the CPU socket lever. Then remove the CPU. Remember to press down the lever as the video shows after you remove the CPU. Enables, disables or auto detects the infrared port. 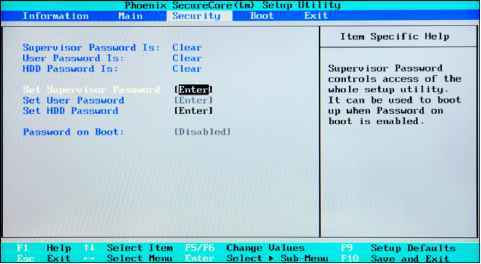 Enables, disables or auto detects the parallel port. Sets the operation mode of the parallel port. Sets the I O address of the parallel port. Sets the interrupt request of the parallel port. Sets a DMA channel for the printer to operate in ECP mode. This parameter is enabled only if Mode is set to ECP. 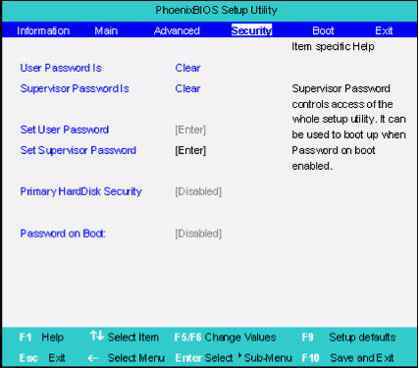 Enables, disables USB interface devices support under DOS mode. See Installing the Speaker Set on page 86. 2. See Installing the DC Board on page 86. 3. See Installing the PCMCIA Slot on page 86. 4. See Installing the Main Board on page 86. 5. See Installing the HDD Bracket on page 87. 6. Put the ODD support bracket to the lower case assembly, and then fasten the ODD support bracket with the one screw. Place the ODD back in the ODD support bracket, and then push the ODD to the original position. See Removing the Battery on page 52. 2. See Removing the Middle Cover on page 56. 3. See Removing the Keyboard on page 63. 4. See Removing the Upper Case Assemly on page 65. 5. To detach the touch pad board, first disconnect the touch pad cable from the touch pad board with a plastic tweezers.Then release the touchpad cover lock on the back as the picture shows. 6. Remove the touchpad cover, the remove the touchpad button pad. Finally remove the touchpad board from the upper case. See Removing the Battery on page 52. 2. See Removing the Middle Cover on page 56. 3. See Removing the LCD Module on page 57. 4. See Removing the Keyboard on page 63. 5. See Removing the Upper Case Assemly on page 65. 6. See Removing the Touchpad Board on page 66. 7. Remove the touchpad scroll key then remove the touchpad cable. See Installing the Speaker Set on page 86. 2. See Installing the DC Board on page 86. 3. 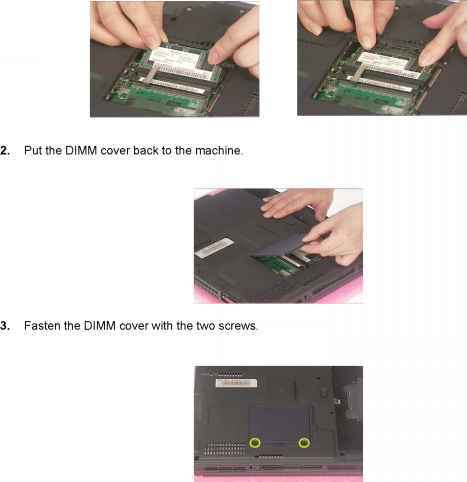 See Installing the PCMCIA Slot on page 86. 4. See Installing the Main Board on page 86. 5. See Installing the HDD Bracket on page 87. 6. See Installing the CPU Heatsink Plate on page 88. 7. Put the FDD module to the main board. Secure the FDD module with two screws. VGA Heatsink Plate on page 88. Floppy Disk Drive Module on page 88 Upper Case Assembly on page 90. 13. See Installing the Processor on page 91. 14. Place the thermal module to the main unit. 15. Secure the thermal module with the four screws. Then connect the thermal module cable to the main board. VGA Heatsink Plate on page 88. 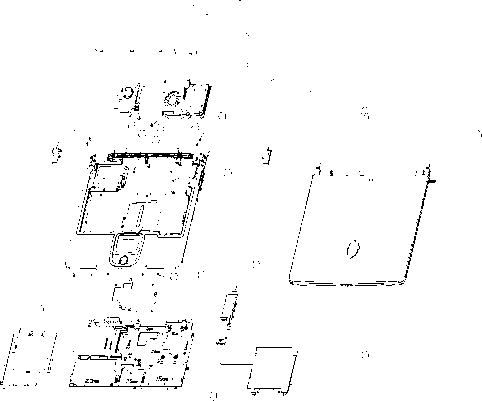 Floppy Disk Drive Module on page 88 12. Attach the upper case assembly to the lower case assembly. 12. Attach the upper case assembly to the lower case assembly. 13. Fasten the 15 screws on the bottom. Then secure the 6 screws as the picture shows. 14. Connect the touchpad cable to the main board. See Removing the Keyboard on page 63. 2. Disconnect the touchpad cable. 3. Remove the 6 screws that secure the upper case to the lower case. Then turn over the main unit and remove the 15 screws holding the lower case to the upper case. 4. Then take the upper case assembly off the main unit. 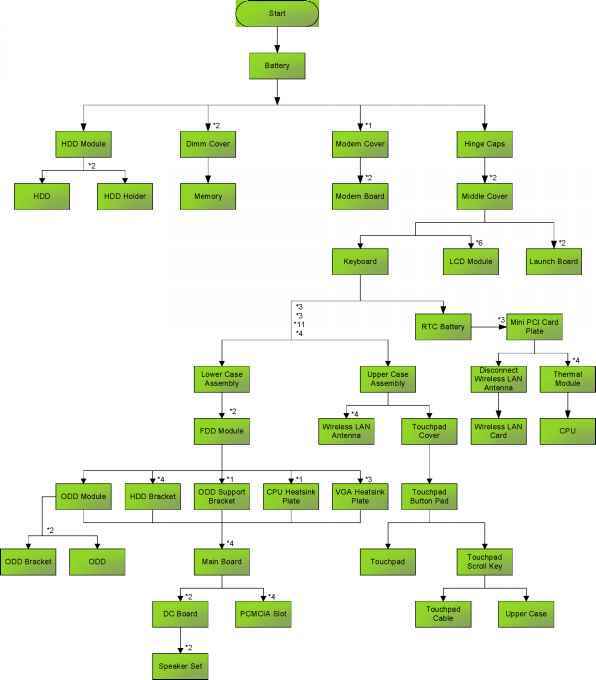 Connects to a parallel device e.g., parallel printer Connects to a display device e.g., external monitor, LCD projector and displays up to 16M colors at 1024x768 resolution Connects to any Universal Serial Bus devices e.g., USB mouse, USB camera . Connects to an Ethernet 10 100-based network Accepts audio line-in devices e.g., audio CD player, stereo walkman . Connects to audio line-out devices e.g., speakers, headphones . When II is on, all alphabetic characters typed are in uppercase. When II Kl is on, the embedded keypad is in numeric mode. The keys function as a calculator complete with the arithmetic operators , -, , and . Use this mode when you need to do a lot of numeric data entry. A better solution would be to connect an external keypad. When H is on, the screen moves one line up or down when you press the up or down arrow keys respectively. does not work with some applications. See Removing the Battery on page 52. 2. See Removing the Middle Cover on page 56. 3. See Removing the Keyboard on page 63. 4. See Removing the RTC Battery on page 63. 5. See Removing the MimiPCI Card Plate on page 63. 6. See Removing the Thermal Module on page 64. 7. Lift up the CPU lever, then place the CPU back to the CPU socket. Please remember to press the CPU lever after you put the CPU back to the socket. See Removing the Battery on page 52. 2. To remove the middle cover, first use a plastic flat screwdriver to remove the right hinge cap. 3. Remove the screw that secures the middle cover. 5. Then remove the screw holding the middle cover on the other side. 6. Detach the middle cover from the machine. 7. Disconnect the launch board cable then remove the middle cover off the main unit.